We love kids! We have done our best to help your children have a blast while learning about Jesus. Each age group has specifically designed environments that are fun, interactive and safe. At each of our services, New Life KIDS offers programs for kids infants through 5th grade. In our Kids’Auditorium, students grades K-5th participate in our services featuring interactive Bible-based messages, fun music, games, prizes, and more! 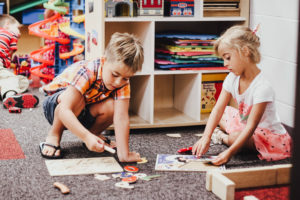 For nursery-preschool age children, our trained team of loving leaders provide age-appropriate hands-on activities for kids to learn about the love of Jesus. These clubs are an energetic Christ-centered opportunity for elementary-age kids to grow in their faith. The kids participate in grade specific activities that keep them engaged and having fun. We have a secure check-in and check-out system to help ensure the safety of your kids. Before your first visit, we encourage you to save time by pre-registering your child by clicking the link below.